100. The writer accompanied two officials of the Jewish Agency for Israel to a meeting with Ilya Levitas, who currently heads an organization dedicated to memorializing the massacre of 33,771 Jews at Babyn Yar in Kyiv during the Holocaust on September 29-30, 1941. Mr. Levitas is an experienced Jewish community leader, having held a number of positions in different Jewish organizations, but his recent efforts have focused on the Holocaust, specifically Babyn Yar. 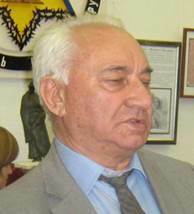 Born in Tashkent, Ilya Levitas began collecting information on the Holocaust as an adolescent while still living in that Central Asian city. He came to Kyiv to attend college in 1945. Mr. Levitas commenced public activity on behalf of Holocaust remembrance in 1985-1986 when the then government of Mikhail Gorbachev made such activity possible. Photo: babyn-yar.gov.ua. Retrieved September 15, 2013. Mr. Levitas acknowledged that six different Ukrainian Jewish organizations each work in memorializing the massacre at Babyn Yar. Current attention to this very painful episode in Ukrainian Jewish history is very different from the situation that existed before Mikhail Gorbachev's tenure, he said. Prior to that time, few Jews ever visited Babyn Yar; those who did venture to the site, he continued, were followed by the KGB (secret police during the Soviet postwar era) or by vigilantes from the Communiist Party. People were afraid to call attention to themselves by pursuing interest in Babyn Yar so they just did not go to the site. 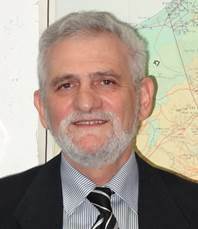 Mr. Levitas also continues research on the role of Jews in Soviet combat forces during World War II. On a personal level, he noted, he became aware that 24 Jews on the street where he lived died in combat. Pervasive antisemitism intimidated many soldiers from publicly identifying as Jews, including several hundred who received military honors from the Soviet state. His research includes discovering and publishing the names of those Jewish combat heroes who felt compelled to identify as Russians, Lithuanians, Armenians, or some other ethnicity; in some cases, Soviet authorities deliberately misidentified Jews who had died in battle. Jews also were very important in the wartime Soviet military industry, both in weapons design and in military industry management, Mr. Levitas said. 101. The Jewish Agency for Israel (JAFI, Sochnut) is a Jerusalem-based organization that works to build Jewish identity and enhance ties between diaspora Jews and Israel. JAFI offers a number of programs designed to encourage aliyah (immigration to Israel) of local Jews and their family members. The writer met with Yaakov Feitelson, the new Jewish Agency emissary in Kyiv. Prior to his current position, Mr. Feitelson worked in Belarus, St. Petersburg, and Moscow for the American Jewish Joint Distribution Committee. Yaakov Feitelson was born in Vilnius, Lithuania. He was permitted to go to Israel in 1972 after several years as a refusenik. The Ukraine demographic situation is precarious, both for the general population and for Jews, stated Mr. Feitelson, citing a World Bank projection that the 2012 Ukraine population of 44,940,268 would decline to 36,074,469 by 2050. The Jewish population of Ukraine has decreased even more rapidly, said Mr. Feitelson, referring to figures prepared by Iosif Zissels, Chairman of the Va'ad and a respected demographer of Ukrainian Jewry. The number of declared Jews in Ukraine in the last Soviet census in 1989 was 460,000; Mr. Zissels estimated 302,000 self-declared Jews in 1992, 204,000 in 1995, 114,000 in 2000, 94,000 in 2005, and 81,000 in 2012. Mr. Feitelson believes that the current number is closer to 100,000 in the entire country, with perhaps 20,000 Jews residing in Kyiv. Including non-Jewish relatives, the number of current Kyiv residents eligible for immigration to Israel under the Law of Return probably is 60,000, he continued. Speaking of individuals with partial Jewish ancestry, but considered non-Jews according to halacha (Jewish law, which defines Jewish ethnicity according to maternal descent), Mr. Feitelson said that, after the enormous losses suffered during the Holocaust, the Jewish people should welcome anyone who wants to be a Jew as a "gift from G_d." It is the responsibility of the Jewish people to teach half- or quarter-Jews how to be Jewish, he stated. Aliyah (emigration to Israel) from Ukraine was down slightly in 2012, compared to 2011, Mr. Feitelson averred. The reason for the decline, he continued, was the ongoing crisis with Iran; Iranian threats against Israel toward the end of the year deterred potential immigrants from proceeding with plans to move to Israel. The rate of aliyah has since improved. One of the most popular aliyah programs, he stated, is the Selah university in Israel preparatory course, which enrolls young people in an intensive 10-month curriculum of Hebrew, English, and other subjects that prepares them for entering an Israeli university or college. The appeal of Selah, explained Mr. Feitelson, reflects the deterioration of education, particularly at the post-secondary school level, in Ukraine. There simply is "no possibility" for a good education in the country; attempts to acquire a sound education almost always necessitate bribes, he said, and such corruption corrupts the giver of bribes as well as the receiver of bribes. Mr. Feitelson then described a continuum of Jewish education opportunities that is necessary for the maintenance of a strong Jewish identity and subsequent aliyah. First, he said, the number of Jewish preschools should be increased as these attract young Jewish families to Jewish life. Next, JAFI needs to expand its summer camp program; the summer of 2013 will see two JAFI camp sessions enrolling a total of 220 youngsters, but both the length of camp sessions and the number of campers should be increased. Adolescents who commit to the Na'aleh high school in Israel program would be better prepared, Mr. Feitelson stated, if JAFI could offer a two-day seminar prior to departure for the first year in Israel; financial constraints limit preparation to a one-day seminar, which is insufficient for the transmission of necessary information, informal socializing, and other activity that would enhance the Na'aleh experience for participants and their families. Finally, he said, JAFI should reinstate its student and young adult clubs that were closed for financial reasons. Moishe House, he acknowledged, partially fills this gap in the continuum, but JAFI should have its own program as well. The writer also met with participants in the Jewish Agency Bar and Bat Mitzvah program, which enrolls approximately 70 youngsters between the ages of 11 and 13 and their parents. The two-year Sunday curriculum focuses on preparation for Bar/Bat Mitzvah and includes classes every Sunday for 30 weeks during the school year, celebration of Jewish holidays, and a field trip to Holocaust memorial sites. In addition to Hebrew and a secular approach to Jewish tradition, students learn about Jewish history, and study English and computer technology. Arts and socializing opportunities are built into the program. 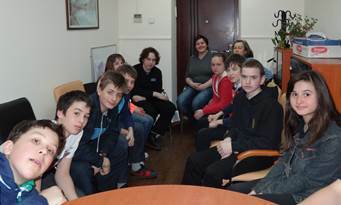 Many participants are drawn from the Kyiv contingent at the Jewish Agency summer camp. An accompanying program known as Tsror enrolls about 30 children between the ages of four and 11 (and their parents). Some activities are held jointly for parents and children, and some separate youngsters and adults into different classes. Youngsters may choose to become Bar/Bat Mitzvah under Reform or Conservative auspices. When asked how they learned about the Bar/Bat Mitzvah program, parents said: they have been active in various JAFI activities for years and learned about it from JAFI announcements; they heard about it from neighbors; and they don't remember how they found out about it. Youngsters said: a sister in Israel in the Na'aleh program heard about it in Na'aleh and told her to register; an acquaintance in his [non-Jewish] school told him about it; they heard about it in a JAFI camp; and their parents knew about it. A boy said that he attends School #128, which once had a Jewish track; however, the Jewish track closed and his former Hebrew teacher there suggested that he continue learning Hebrew in this program. A parent said that her son had a very good experience in a JAFI summer camp and she wanted him to become a Bar Mitzvah, so a JAFI Bar Mitzvah seemed logical. Other parents said that they want their son to participate in Na'aleh, just as their daughter has done; the Bar and Bat Mitzvah program seems to be a good introduction to Israel. A small number of Bar/Bat Mitzvah partic-ipants and a few parents crowded into a JAFI office to speak with the writer. Additional Jews and people of other ethnic groups were killed at Babyn Yar later during World War II. Individuals of Jewish ancestry in the Soviet Union were considered Jewish by nationality and were indicated as such on the fifth (nationality) line of their internal passports. One could not be both Russian and Jewish, Ukrainian and Jewish, etc. Many of the Jewish museums that have been established in recent years also have expended significant efforts in identifying Heroes of the Soviet Union who were Jewish, wartime Jewish generals and other prominent Jewish military figures, noteworthy Jews in the Soviet military industry, etc. ; as an example, see the Holocaust Museum in Odesa that is described in this report (pages 21-22). See pages 134-135 for more information about Mr. Zissels. Mr. Feitelson did not mention Jewish day schools, perhaps an oversight, but perhaps recognition that day schools are losing enrollment and that some see Na'aleh as unwelcome competition for high school students. He also failed to mention Sunday schools, the Hillel student organization, the Ukrainian Union of Jewish Students, and Jewish religious streams that sponsor various informal Jewish education programs.